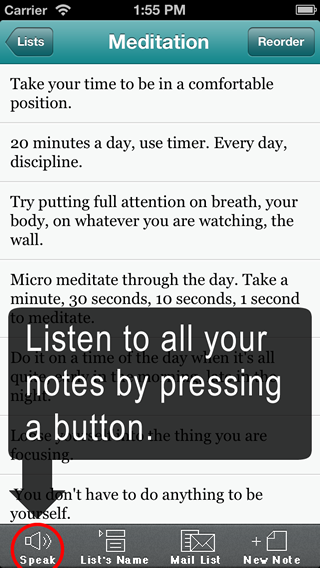 Tap a button, listen to all your notes! No internet or wifi required! All the voice synthesizing is made within the iPhone, so no internet connection is needed. 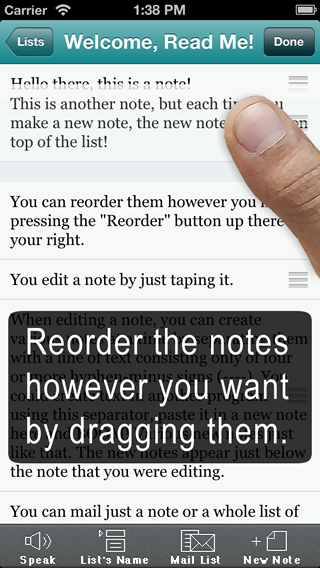 Notes&Order is probably the simplest note app that is out there. • Group your notes by subject (in lists). • Put many subjects in the playlist, to listen to all of them. • You can even loop the playlist and listen to your notes for all of eternity, if you so desire. This function may help you to ingrain some information in your brain, or do some self-brainwash. Use it as you want! Get it on the AppStore!